Send Peony Rose anywhere in Ireland. With its deliciously-sweet light scent and bountiful whorl of petals, the peony rose is a delightful bloom that speaks of love, well-suited to most occasions. We incorporate only the finest fresh-cut peony roses in our hand-tied bouquets, creating an extraordinarily breath-taking display and ensuring lasting freshness. 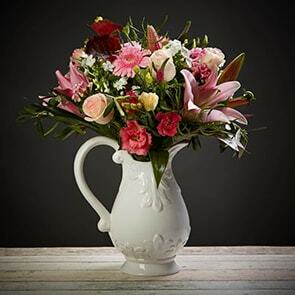 Take advantage of our next-day flower delivery Ireland or same-day flower delivery Dublin and send a thoughtful gift, even at a moment’s notice. All offerings in the Bloom Magic catalogue are designed expressly for us by Ireland’s top floral experts, with unique arrangements ideal for every occasion and suited to a particular taste or style. Our dedication to creating distinctive offerings means that we routinely incorporate local blooms in our bouquets and create presentations that are naturally gorgeous- without the need for excess packaging. This means that each and every bouquet carries a luxurious essence and remains vibrant for at least one week after delivery. Note cards can be added to any order if you’d like to include your personal sentiments. We also carry a selection of tasteful vases, mouth-watering chocolates, and other items to treat your recipient, enabling you to create a truly one-of-a-kind gift with just a few clicks. 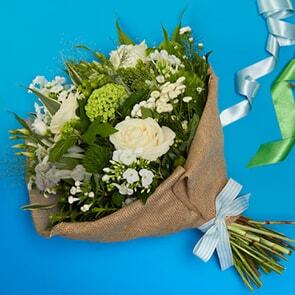 Receiving flowers should be an unforgettable experience and ordering them should be a simple, seamless process. At Bloom Magic, we know that your gift is an extension of you, as well as representative of your relationship with the recipient, which is why we focus on quality and providing the finest service possible. We’re available by phone, email, and live messaging on the site to provide assistance in whichever manner is best for you. Contact us at any time or place your order in confidence, knowing anything you select is backed by the Bloom Magic Quality Guarantee.